Ten Wednesdays: September 9th to November 11th; 4:30-6:00 p.m.
Our most popular summer camp is now available during the school year! 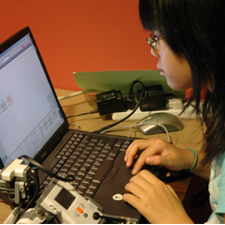 Join us at HMNS in Sugar Land after school to explore the basics of NXT Robotics Engineering. You and your partner will build models with our LEGO MINDSTORMS NXT TM system and then use a computer to program your model to obey your every command! Compete with other teams to finish challenges and earn the highest scores by the end of the course. This program limited to 16 students in grades 4 – 7 with a minimum of 10 students per session. Students must be walked to the classroom and signed in to the course by a parent or guardian.